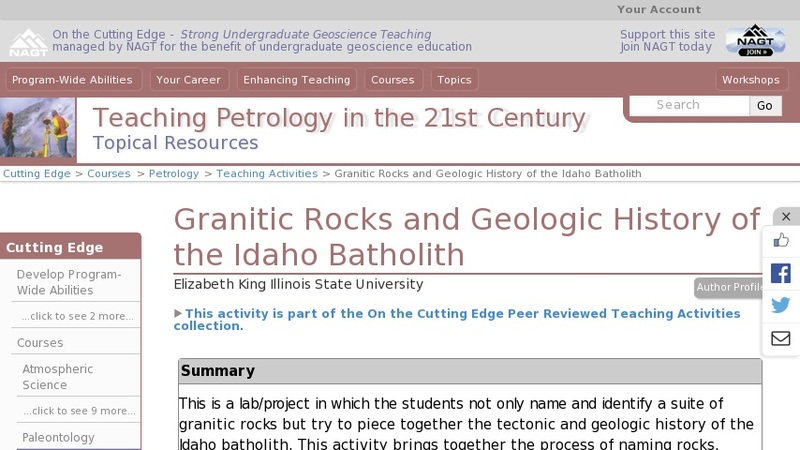 This is a lab/project in which the students not only name and identify a suite of granitic rocks but try to piece together the tectonic and geologic history of the Idaho batholith. This activity brings together the process of naming rocks, determining the I-, S- and A-type nature of the rocks, estimating magma source and potential assimilants, a nonquantitative depth of intrusion for the suites, and any distinctive textures that might help tell the story of the batholith. It forces students to move outside the rock in a box lab for granites and create a regional geologic history. I find this project to work well in class for a number of reasons. Group work and counting on your classmates to interpret the rocks is a foundation of the entire project. The students get exposed to more rocks than in a typical lab without having to identify each of the in great detail since they are ultimately only responsible for their own suite. I have removed at least one lecture on granites and replaced it with this project for them to do the interpretation themselves rather than just passively absorb the geology. The students have just a basic introduction to I-, A- and S-type granites and the models for the generation of these magmas. They have already learned about grain size relating to cooling rate and depth of intrusion, but it usually is awhile since they thought about these concepts. Obviously this project depends on the exact samples being available, but the theory of the project can be applied to numerous geologic settings.